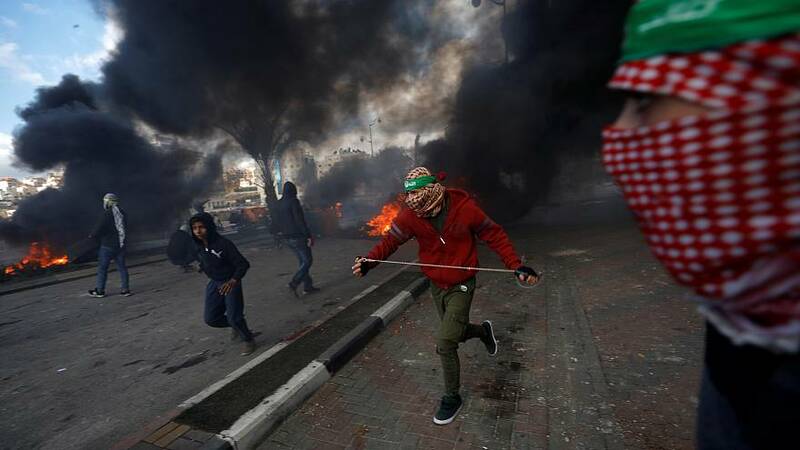 Clashes erupted across the West Bank on Thursday, as Palestinians protested against US President Donald Trump's recognition of the disputed city of Jerusalem as Israel's capital. The powerful Islamist group Hamas has urged Palestinians to abandon peace efforts and start a new uprising – or Intifada - against Israel. Palestinian President Mahmoud Abbas has also called on protesters to stage rallies, but said they should be peaceful. At least 30 people have so far been wounded in the clashes, some hit by live bullets, according to emergency services. One person was in a critical condition, Gaza’s health ministry said. More troops were being deployed across the occupied West Bank, ahead of what Hamas warned would be a 'day of rage' this Friday. Rallies and protests are expected near Israeli-controlled checkpoints and along the border with Gaza. In the West Bank cities of Hebron and Al-Bireh, thousands of demonstrators rallied with chants of "Jerusalem is the capital of the State of Palestine", witnesses said. Some Palestinians threw stones at soldiers. The Israeli military said two rockets had been fired towards Israel from the Hamas-ruled Gaza Strip, but did not cross into Israeli territory. Dozens of protesters also gathered near the border fence with Israel and threw rocks at soldiers on the other side. "We should call for and we should work on launching an intifada in the face of the Zionist enemy," Hamas leader Ismail Haniyeh said in a speech in Gaza. "Let December 8 be the first day of the intifada against the occupier," he said. All Palestinian factions have called a general strike in protest over Trump’s declaration on Jerusalem on Wednesday (Dec. 6), which reversed decades of US policy, infuriated the Arab world and upset Washington’s Western allies. The status of Jerusalem - home to sites holy to the Muslim, Jewish and Christian religions - is one of the biggest obstacles to reaching a peace agreement between Israel and the Palestinians. Israel claims all of Jerusalem as its capital, including the eastern part, which it has occupied since 1967, and which the Palestinians want as the capital of their own independent state. In recognising Jerusalem as Israel's capital, Trump was seen as siding with Israel's government, which says it will not give up any part of the city. Palestinian President Mahmoud Abbas has suggested the US disqualified itself as a broker in the peace process, a role it played for more than two decades of stop-and-go negotiations on setting up a Palestinian state alongside Israel. There’s now growing fear of an outburst of violence during Friday prayers at Jerusalem’s Al-Aqsa Mosque compound.